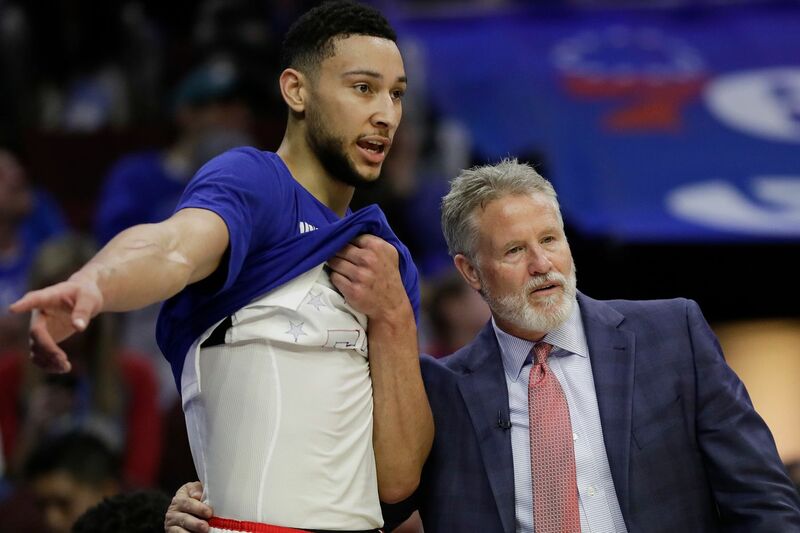 Sixers coach Brett Brown and guard Ben Simmons have talked about getting Simmons' game ready for the playoffs, and that includes expanding the range of his shots. The second half of Sunday’s 76ers win over the Lakers had just started when the extraordinary happened. Ben Simmons casually pulled up from behind the three-point line and let a shot fly. The only three-pointers Simmons had attempted before were heaves at the end of a clock. Some said a legitimate in-game three from Simmons would never happen. And it happened so quickly that some are in disbelief that it even happened at all. People were still filing back into their seats at the Wells Fargo Center after halftime when Simmons decided to defy expectations and pull up from beyond the arc. Even Simmons’ teammates were not ready for him to unleash the trey, which was on the mark but spun out. Behind the scenes, though, there was plenty happening that led to that moment. It is no secret that the one criticism of Simmons’ game is his lack of an outside shot. Not being a threat anywhere beyond 10 feet from the rim, Simmons has not given defenders reason to care about him on the perimeter. It was exactly that limitation that allowed the Celtics to render Simmons ineffective during last season’s Eastern Conference semifinals. With all that in mind, Brown broached the subject with Simmons, hoping that between now and the end of the season the young All-Star will be able to incorporate depth into his game. Simmons is already considered by many to be one of the top 25 players in the league, and his becoming a shooting threat would not only maximize his abilities and transform his individual game, but it would also open up spacing and opportunities for the Sixers. Simply put, a reliable jumper could put Simmons into the conversation of being not just one of the top 25 players in the league, but rather, one of the few elite. As Embiid said after the game, even if Simmons doesn’t hit those shots, just taking them is a game-changer. Simmons has the encouragement and support of his teammates and coaches, who are excited to see this next phase of his development. Even newcomer Tobias Harris weighed in after the game with pride in Simmons. Though it was on target, Simmons’ shot did not go in Sunday. But if this is an indication of things to come, we’re not far off from seeing him sink a three in the flow of a game. Stay tuned.